The Def Guide to Zzap!64 • View topic - Superplay just finished !!!!!!!!!!!!! Post subject: Superplay just finished !!!!!!!!!!!!! Yep another mag has bitten the dust,this time Snes related (the Canon scanner was killed in making this disk ). All fits on a nice shiny dvd and will be available via me for the usual £15 worth of beer tokens and will try to get the scans up somewhere freely asap. Another one for me to save up for! Post subject: Re: Superplay just finished !!!!!!!!!!!!! Whoa, that's amazing, how did you do that with their bigger format?? Oh and if you want a pic of the binder, I can do that as well. Mayhem list sent, Here is the list incase anyone has anything else I may have missed. And here's a teaser of the DVD inlay! I've got some dummy issue 0 chromalins that might make a nice extra if you're interested. Wil as in "Wil Overton"? Nah!? Well, I was a big fan of Zzap! and Crash long before I got into mags. No playground battle for me (well, I'd left school by then, anyway) I had a C64 and a Speccy! 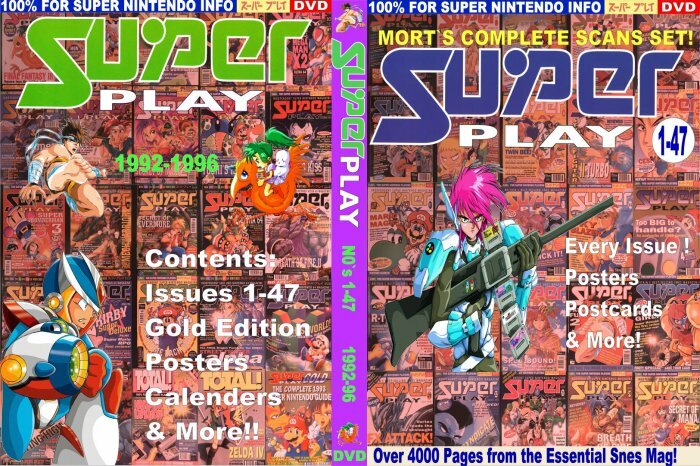 Well over here we *know* our classic mags, and SuperPlay was certainly one of the best mags ever. And what Oliver Frey was to Zzap!64, you were to SuperPlay. Great to have you here, and that site in your contactsheet is just lovely. I guess that's what you do these days? Nah, dinkybox is just a part time thing I started with my better half last year. I work at Rare now. I still speak to old magazine mates, though. I'll never get Stevie J to admit his Newsfield days were better than now!